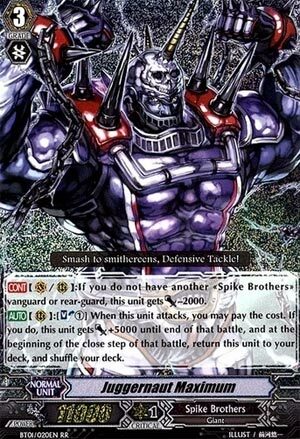 [CONT](VC/RC):If you do not have another «Spike Brothers» vanguard or rear-guard, this unit gets [Power]-2000. [AUTO](RC):[Soul Blast (1)] When this unit attacks, you may pay the cost. If you do, this unit gets [Power]+5000 until end of that battle, and at the beginning of the close step of that battle, return this unit to your deck, and shuffle your deck. Ah, there was always room for this back in Bad End Dragger builds. Fun times. Unfortunate that this thing just sort of fell by the wayside in Rising Nova builds for G Standard though.